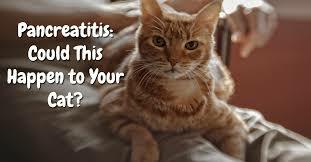 Pancreatitis in cats is a condition that requires immediate attention by a veterinarian. Cats can develop chronic or acute pancreatitis. Symptoms may be subtle initially and easy to miss. Symptoms include include loss of appetite, fever, weight loss, dehydration, fatigue, depression, and increased heart rate. If your kitty displays these symptoms or just isn't acting like herself, please contact your veterinarian right away as pancreatitis can be fatal.